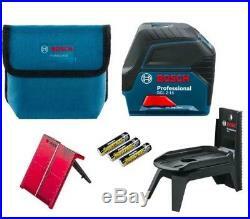 NEW BOSCH GCL 2-15 Self Leveling Cross Line Laser Level/Plumb +RM1 Mount Pouch. 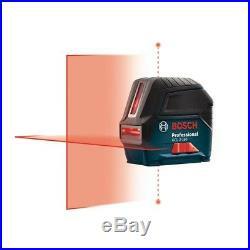 Horizontal and vertical laser lines and two centred plumb points with optimal visibility. Laser lines can be positioned around the centred plumb points. Flexible to use with rotating RM1 professional multifunctional mount for aligning the laser lines and for versatile mounting of the tool. Pendulum lock ensures safe transport. 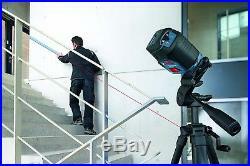 The laser lines are highly visible for fast horizontal or vertical levelling tasks. With the aid of the included RM1 rotating mount, the user can easily position the laser lines around the plumb points – making levelling tasks faster, more precise and more convenient. 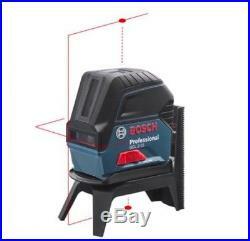 1 x Bosch Combi Laser. 3 x 1.5 V LR6 (AA). 1 x Canvas Case with Belt Loop. 1 x RM1 Professional rotating mount. 1 x Target plate. 1 x 1/2 L-BOXX inlay for tool Specifications Laser diode 630 650 nm, < 1mW Operating temperature -10 50 °C Storage temperature -20 70 °C Laser class 2 Working range 15 m Accuracy ± 0.3 mm/m Working range of laser points, max. 10 m (top) , 10 m (bottom) Self-levelling range ± 4° Levelling time 4 s Dust and splash protection IP 54 Power supply 3 x 1.5 V LR6 (AA) Operating time max. 6 h in cross line and point mode , 8 h in cross line mode , 12 h in line and point mode , 16 h in line mode , 22 h in point mode Tripod thread 1/4", 5/8" Weight, approx. _gsrx_vers_811 GS 7.0.9 (811). The item "BOSCH GCL 2-15 Self Leveling Cross Line Laser Level/Plumb +RM1 Mount Pouch NEW" is in sale since Tuesday, December 18, 2018. This item is in the category "Home, Furniture & DIY\DIY Tools & Workshop Equipment\Measuring & Layout Tools\Levels". The seller is "bowman76" and is located in Oxford. This item can be shipped worldwide.